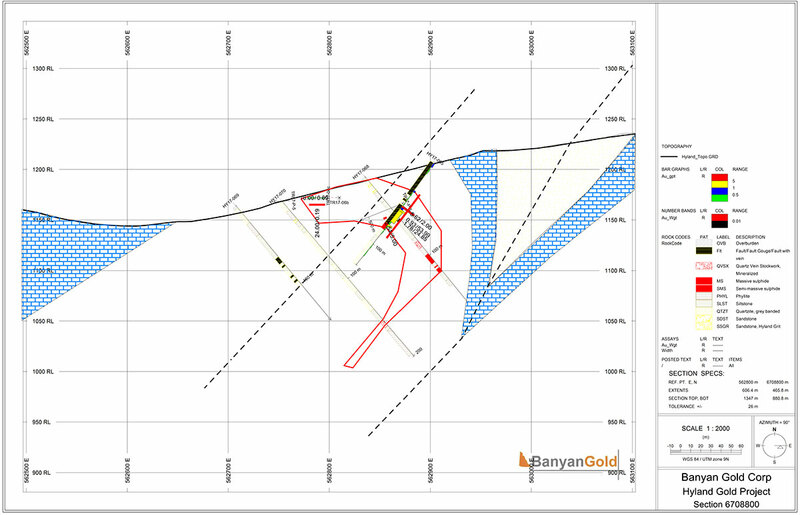 BANYAN GOLD CORP. (“Banyan” or the “Company”) is pleased to announce results from the next six holes of its 2017 Exploration Program at its 100% owned Hyland Gold Project (the “Property”) in the Yukon’s emerging Selwyn Basin District. 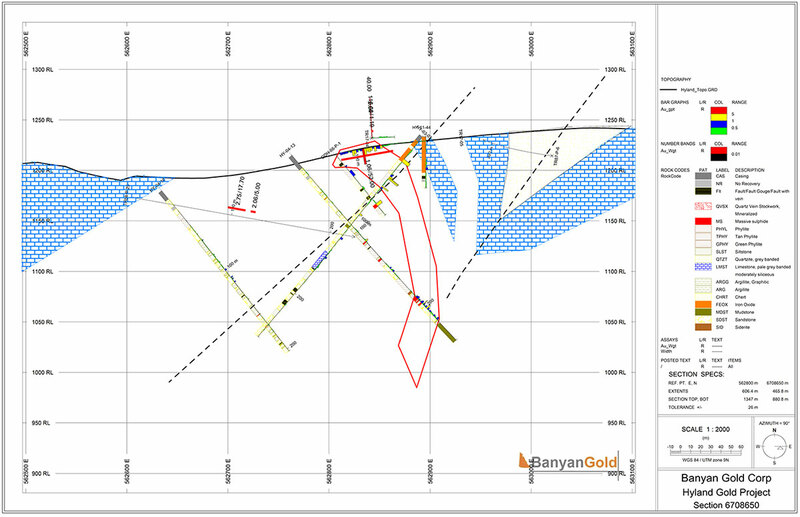 These long, continuously mineralized intersections of gold and silver mineralization were punctuated by high-grade intervals such as 1.5 metres of 6.3 g/t Au and 5.4 g/t Ag from 45.1 to 46.6 metres in HY17-062 and 24.85 metres of 1.78 g/t Au and 8.23 g/t Ag from 52.15 to 77 metres in drill hole HY17-065. 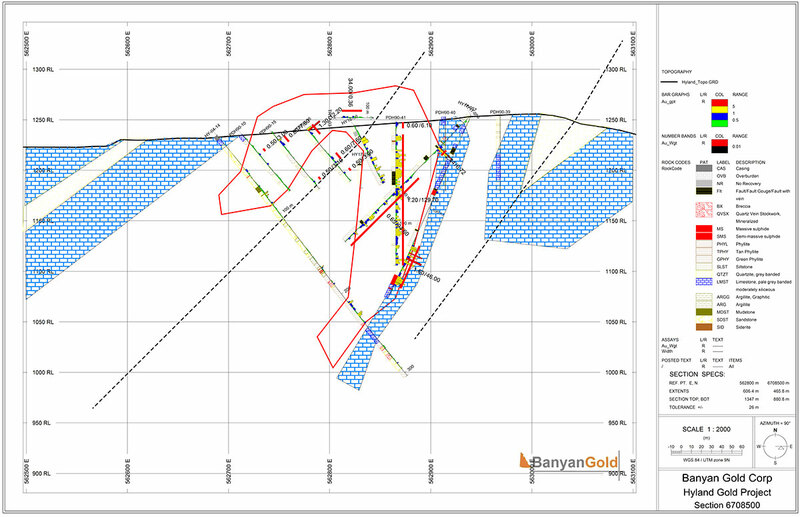 The 2017 Hyland exploration program was completed at the end of September and culminated with 3,847 metres of diamond drilling from 25 drill holes focused on in-fill drilling, step-out exploration and dedicated metallurgical drilling concentrated on the Hyland Gold Main Zone gold-silver deposit. 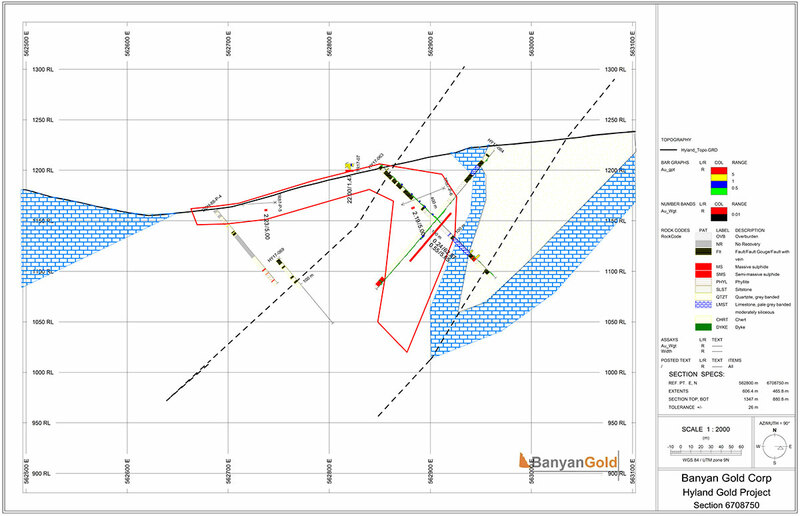 This year’s exploration efforts were focused on increasing confidence in the Main Zone Resource* model as well as targeting resource expansion via testing the northern portion of the Main Zone, a previously under-tested zone prospective for the continuation of the Main Zone gold-silver mineralization. Drill holes HY17-059 to HY-17061 were all drilled from the same pad, to maximize drill fence coverage on this important step-out exploration section. HY17-059 had a steep dip to the east and 060 and 061 were more shallowly east dipping. HY17-060 collared in a mineralized fault and was abandoned at 10 metres due to very poor recovery (<20% recovery – a typical problem when drilling the near-surface portions of the Main Zone Deposit). The hole was re-drilled successfully as HY17-061 and intersected the near surface and deeper mineralized zones on the limbs of the anticline, once again validating the Main Zone resource model. 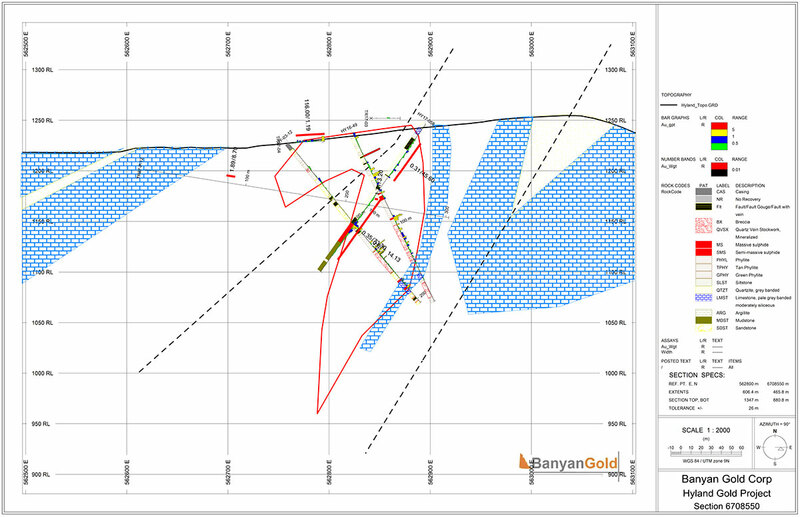 A deeper mineralized zone was also intersected in HY17-062, 100m further to the east along section. 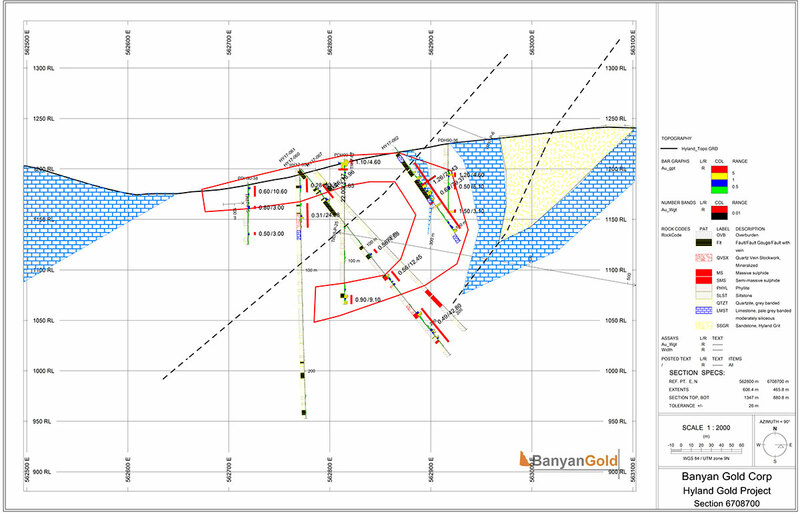 Drill-holes HY17-064 and HY17-065 represent 50 metre and 100 metre step-out exploration test holes, respectively and targeted a predicted extension to the mineralized zone proximal to the hinge of the interpreted antiform which controls the Main Zone Deposit. HY17-064, was the 100 metre step-out exploration hole on this section while HY17-065, the 50 metre step-out drill-hole intersected the near-surface mineralized zone within the hinge of the antiform. The full results from these six drill holes are provided in the following table. Maps with drill-hole locations and sections can be found on the Company’s website (http://www.banyangold.com/projects/hyland/). Lengths above are drill intervals. True widths are estimated to be 60-70% of drilled lengths. HY17-065 is interpreted to be a true width. The technical information in this news release has been reviewed and approved by Paul D. Gray, P. Geo., a Qualified Person as defined by NI 43-101. All drill core samples collected from the Hyland Gold program were analyzed at Bureau Veritas Minerals of Burnaby, B.C. utilizing the four acid digestion ICP-MS 35-element MA300 analytical package with FA450 50-gram Fire Assay with AAS finish for gold on all samples. 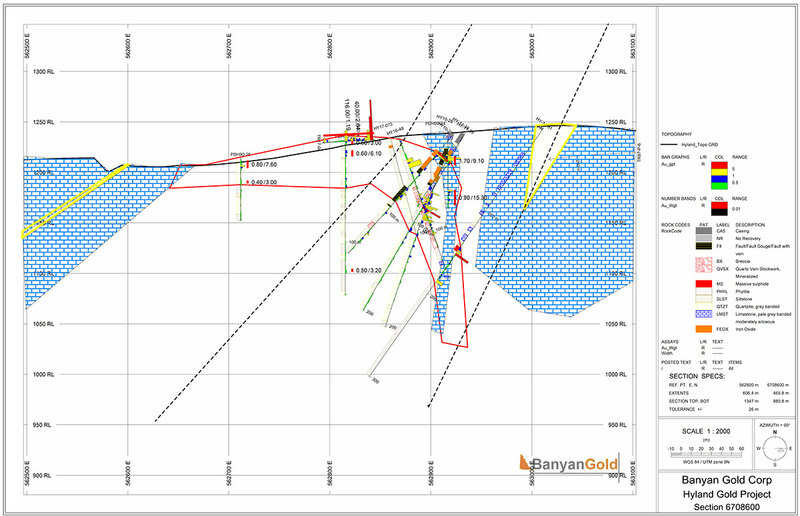 All core samples were split on-site at Banyan’s core processing facilities at the Hyland Gold Project. Once split, half samples were placed back in the core boxes with the other half of split samples sealed in poly bags with one part of a three-part sample tag inserted within. All these samples were delivered by Banyan personnel or a dedicated expediter to the Bureau Veritas, Whitehorse preparatory laboratory where samples are prepared and then shipped to Bureau Veritas’s Analytical laboratory in Burnaby, B.C. for pulverization and final chemical analysis. A robust system of standards was implemented in the 2017 exploration drilling program and are monitored as chemical assay data become available. The newly acquired 9,230 ha Aurex-McQuesten Property, in close proximity to Victoria Gold's Eagle Project and Alexco Resource's Keno Hill Silver District, is highly perspective for structurally controlled, intrusion related gold-silver mineralization in relation to quartz monzonite dykes of the Tombstone intrusive suite.